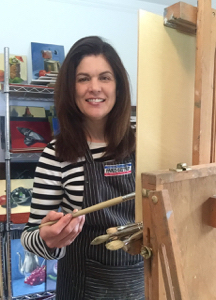 After having been a ceramic artist for twenty years, I began studying painting five years ago. I've put in many, many hours in to develop my painting style and quality and am once again ready to exhibit work. My original oil paintings consist of still lifes, portraits and landscapes all done on rigid canvas panels. One of the most important aspects of my work is my devotion to working strictly from life. I get energy and inspiration from painting directly from my subject--whether it be a sugary cake warmed by my lighting, a dramatic sky over a bare field in spring, or a sleepy-eyed model. I also take care in framing my paintings to create a finished work of art that clients can immediately hang and enjoy in their homes. The guiding principle in all my paintings and drawings is to work directly from life. Whether it's a bunch of radishes in the studio, or a rushing creek in the woods--having an unfiltered connection to my subject is my first priority. I love the challenge of standing in front of any subject and expressing it with the simple and timeless materials of brushes and oil paints.